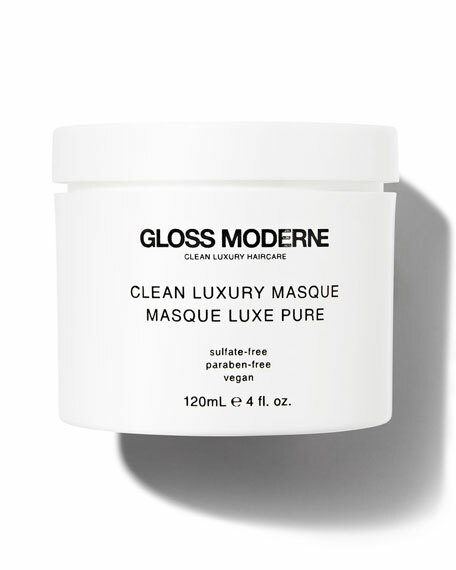 GLOSS MODERNEClean Luxury Masque, 4 oz. Resplendent moisture-treatment masque for instant gratification and startling shine. Use weekly or even daily, and get swept away by the signature fragrance of Coco de Soleil. Get Glossed. For Runway-Ready Results: Massage into rinsed hair for 5+ minutes. Rinse. C'est magnifique. GLOSS Moderne is Clean Luxury. 100% Sulfate-Free + Paraben-Free. Luxury haircare with technically advanced, ultra-prestige formulations for every man, woman and child. Developed by the beauty industry's top experts and the best chemists in the world, the award-winning Clean Luxury Haircare Collection was created with the latest technology for unparalleled efficacy. Combining performance with all the sensorial aspects of beauty, the GLOSS Moderne Collection is the epitome of luxury. Our signature Coco de Soleil fragrance was created by one of the most highly acclaimed global fragrance houses ... a sensual, intoxicating fragrance reminiscent of the French Riviera. The pure white and lacquer design aesthetic of our packaging brings beauty to every bath and home. GLOSS Moderne is truly a sensory experience. 120 mL/ 4.0 fl. oz. GLOSS Moderne is Good For You + Good For the Planet. No parabens, sulfates, sodium chloride, phthalates, gluten or animal testingever. GLOSS Gives Back. GLOSS Modern is passionate about modern responsibility and innovation. Its vision is to drive big positive change, see beauty in a new way. Experience the Clean Luxury of GLOSS Moderne.